April 2011 – CREATE. PLAY. TRANSFORM. It came a little late this year. It’s here now. No one can stop it. And it’s rising each and every single day. Yes! It’s summer time in The Philippines!!! Being in a tropical country means two things: sun and rain. No winter, spring, or autumn. During this time of the year, some people choose to go to the beach to beat the heat, by wearing lesser clothes and flaunt their swim wear. Some are found in air conditioned malls and spend the whole day in them until the sun is out, and there are those who spend the whole summer out of the country. People in the corporate world are so lucky, because they spend most of their time in a cool office, where light jackets or coats are worn to keep them warm, somehow. But what do the others do? What have they decided to get themselves busy with this summer? 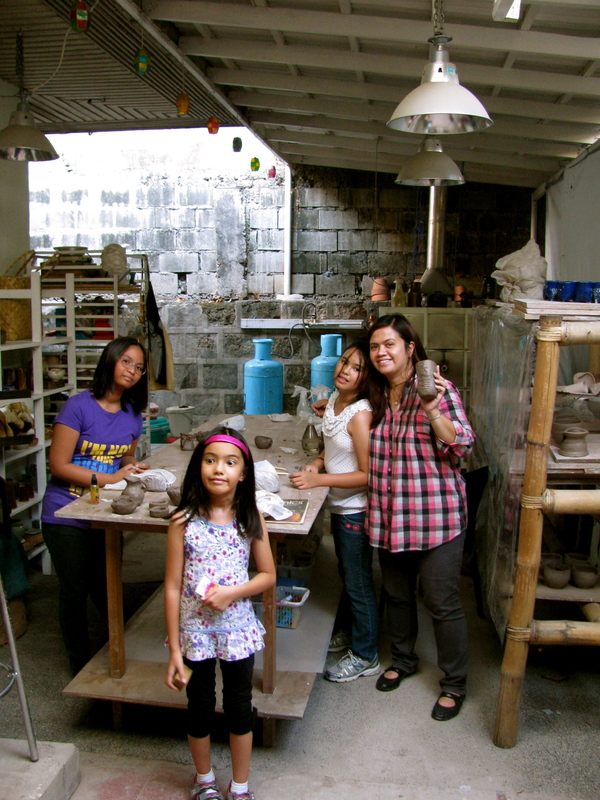 Some of them choose to go to Quezon City and get their hands dirty with clay! 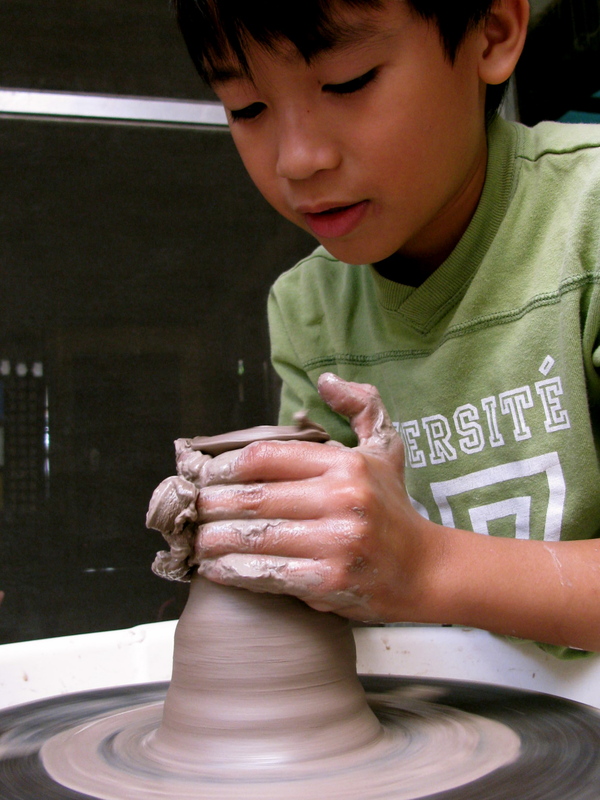 Learning Pottery is not limited to the older ones with bigger hands. You can be as young as Diego here, who is only eight years old. 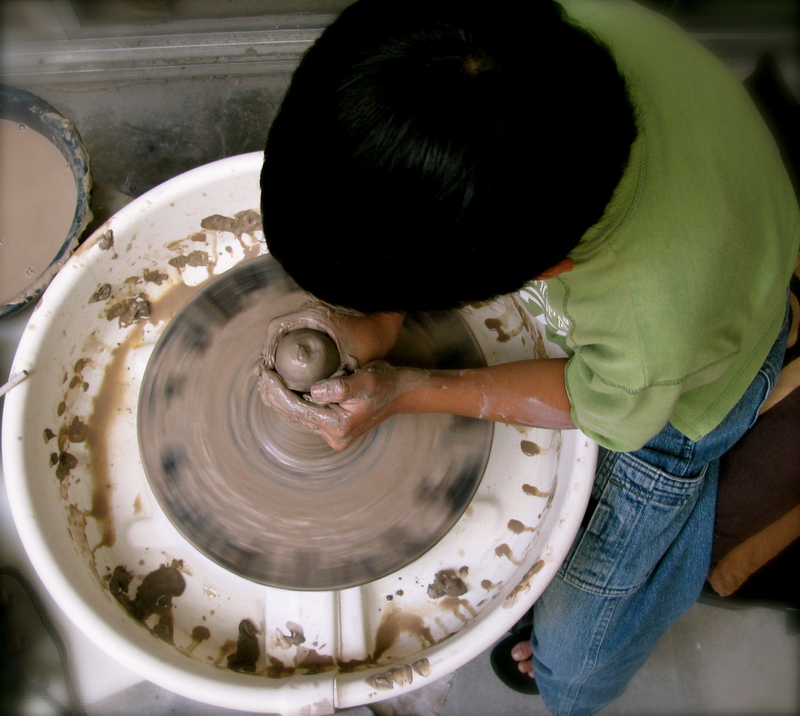 He started learning pottery at the age of six. He comes in the pottery studio with very clean clothes. After two hours of working on the wheel, he doesn’t mind getting himself all dirty with clay! Now, who says that all the fun can be found these days with video games alone? Who still gets dirty while having a great time? Here’s a family (three on the right), who bonds with clay and get their creative juices out together. They learn the Basics of Hand Building together and they are in the same class! Kianna (on the left) is having fun too! Who pinches clay these days? 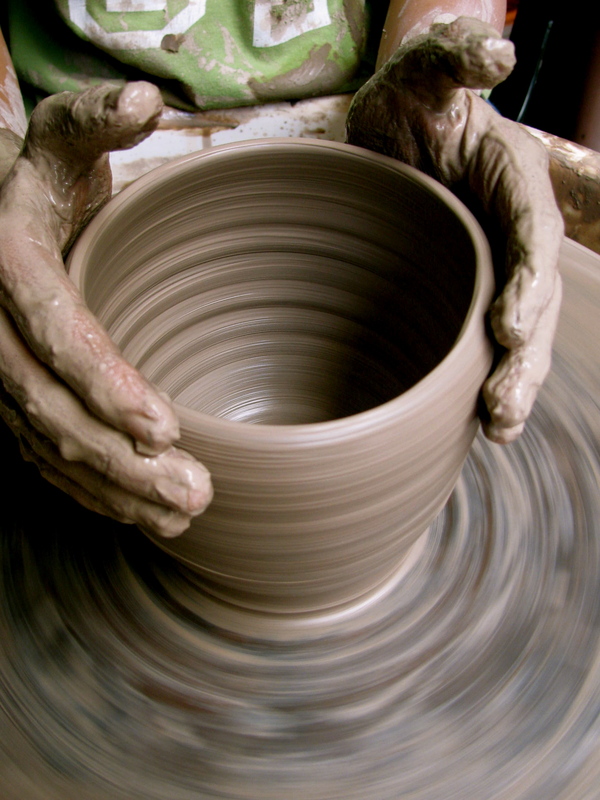 This technique is the first lesson to be learned in making pottery. It is neglected by some, but it is the best technique, to familiarize the students with the medium. These are some of the pinched pots that the students made on their first week. 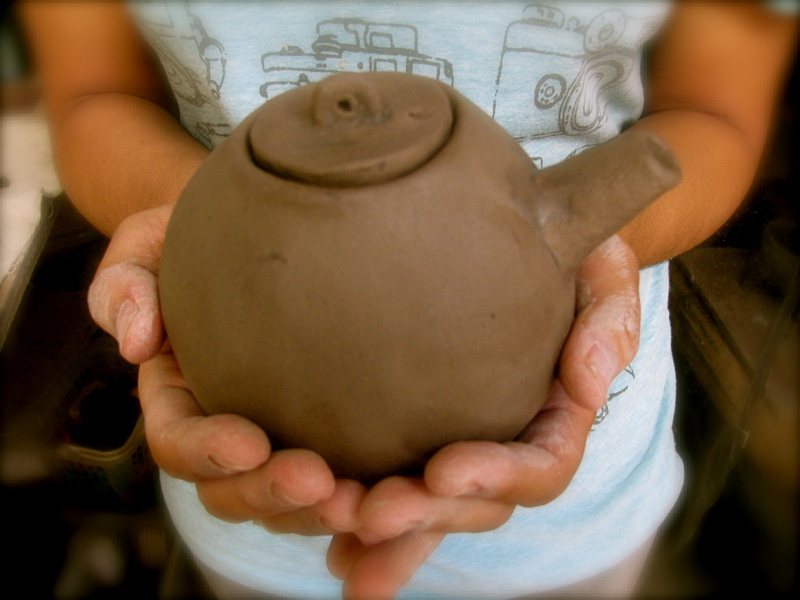 Here’s another pinched pot that was turned into a teapot by one of my students. A handle is waiting to be placed here. She formed two pinched pots and joined the rims together. The spout, lid, and handle were made separately. 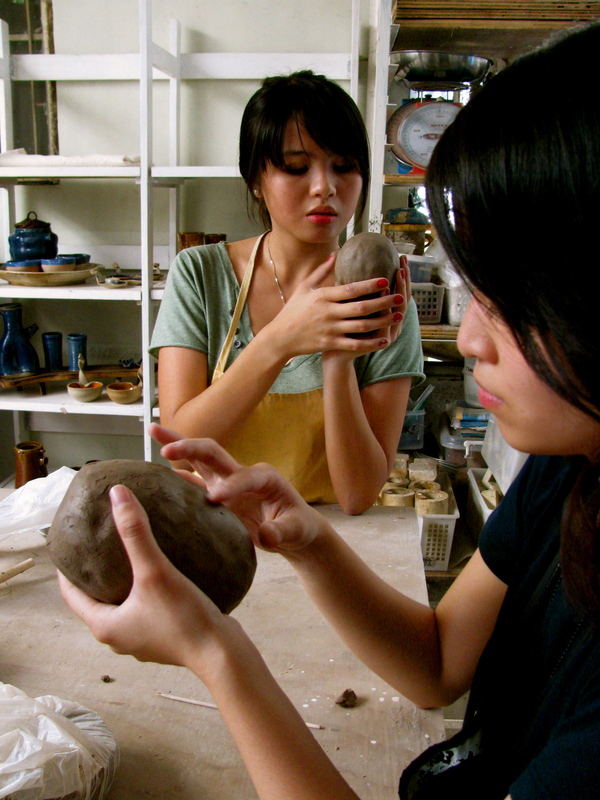 Learning Pottery can bring out one’s creativity, patience, and excitement. You come to the studio clueless. Not knowing what to create or what you CAN make. 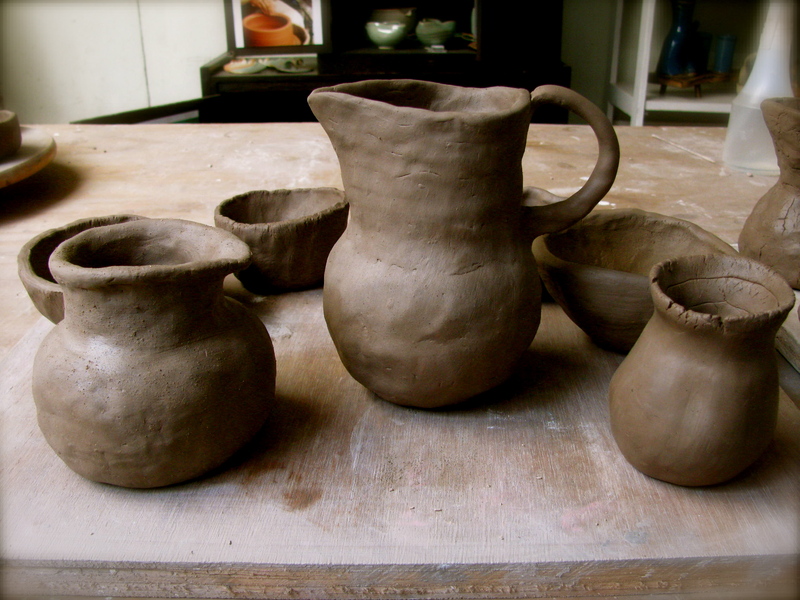 By learning the Basics of Hand Building Pottery, working with pots is not intimidating anymore. One would keep coming back for more pots to make. With clean hands and clothes to literally mess around with! Metro Manila is a huge city and I grew up right in Quezon City. I know every main and side street of this town. Recently, as I explore the artsy scene of my hometown, I met an interesting man. His name is Jetro Rafael and he owns the very creative and unexpected Van Gogh Is Bipolar on Maginhawa Street. I have not tasted the food that he serves yet, but visiting his home gives me a taste of his eclectic menu. He is not only well traveled around the globe, but he enjoys talking casually about life and what he can offer to people. He basically offers himself and what he knows which includes Travel, Photography, Art, Food, and practical advice on choosing emotions. He mentioned about this new place in QC that will open in May. I told him that I make Handmade Ceramics and that I am looking for places in Manila where I could sell my pots. He asked me to check out this new place which is being run by his friend, “Resurrection”: Furniture and Found Objects Gallery. I am the type of person who gets all excited when I get the chance to discover new places. With all the artistic vibe that is going around QC these days, who will not get excited to see what’s next? One day, while teaching pottery to a student of mine, we’ve decided to have lunch out after getting our hands dirty with clay and visit Alabama Street. I thought I knew Quezon City too well. I love it when I go to places for the very first time and discover creative happenings in the area. The blue and white gate captured my attention right away. To my surprise, Jetro, was in the space too! He showed me around the old home which now holds his tea laboratory, “Hausbesetzer.” He told me and my student that we are the first ones to ever see his laboratory! I loved every single thing that I saw in there. Jetro! I have yet to give you my handmade tea set! I will not describe how everything looks like in this blog. That is for you, my readers, to find out for yourselves. How? 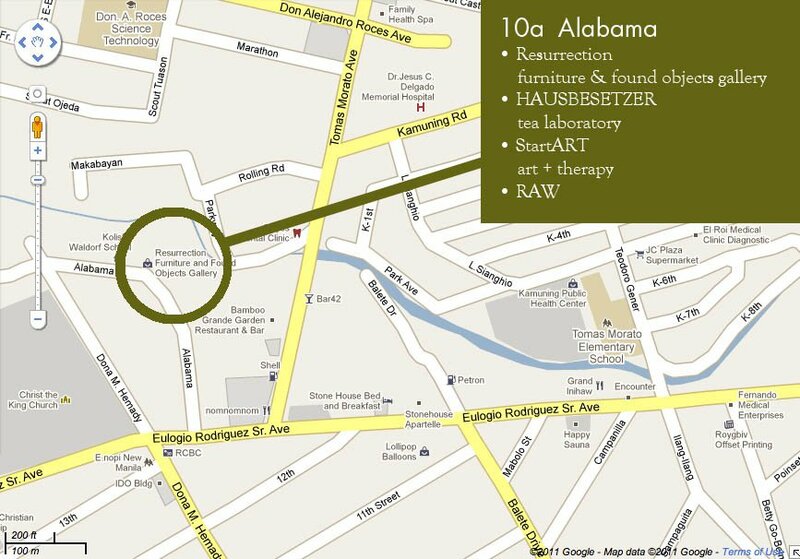 Come to the opening of 10A Alabama in May 14th and 15th! I’ve never seen anything like this in Quezon City in my thirty three years of existence in this town. In Brooklyn, sure. But here in Manila? This is a first! I will be selling my handmade pottery along with other Philippine artists who will sell their creations. 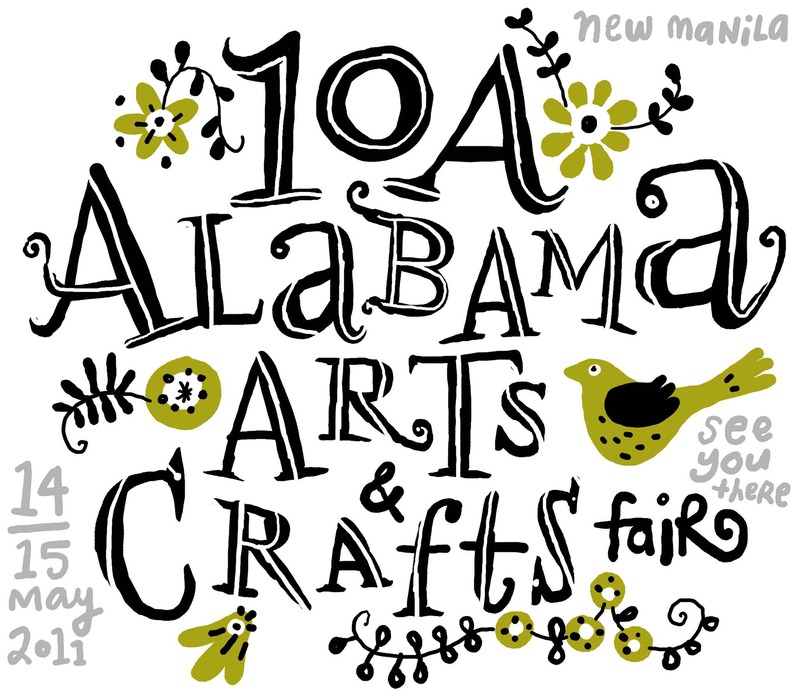 The Arts and Crafts Fair starts at 9AM! I’m starting to work on my new pots and stoneware jewelry for this fair. I heard it’s going to be a lot of fun! Hope to see you there!